Home › Active learning › Fun online quizzing with Kahoot! This week we are reviewing one of my favourite classroom tools, Kahoot! 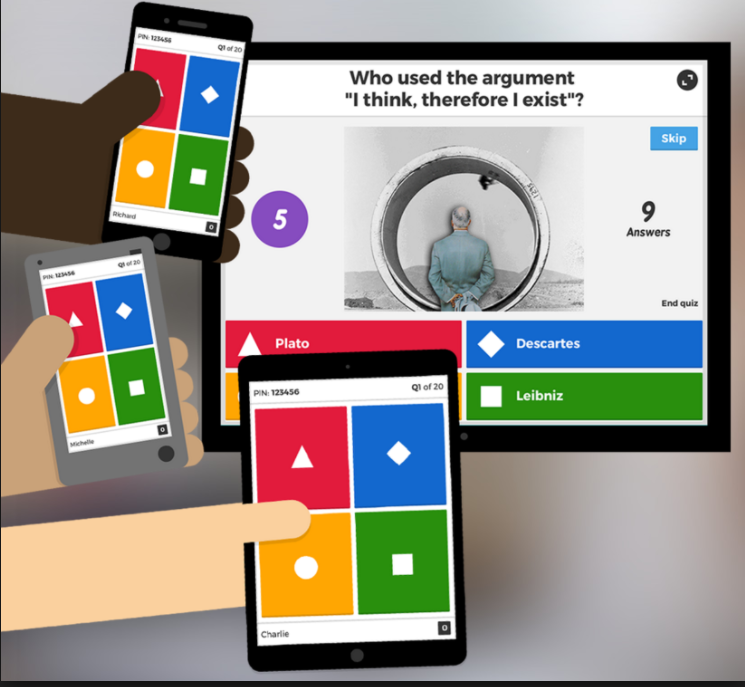 Kahoot is a free online quiz tool that enables you to design quick fun quizzes for students for use within the classroom. It can be played competitively, cooperatively, solo or with a large group of people. Kahoot allows you to create your own multiple choice quizzes entering your question and answers, there is also the option to attach an image to any or all of your questions. The questions are then projected onto a screen and students can submit their answers using their mobile devices or laptops and computers through a web browser. A unique PIN code is generated for every Kahoot session, which students enter on the Kahoot web page to join the quiz. This makes it very easy for a large number of students to join a quiz with minimal setup and hassle. After all students taking part in the quiz have submitted their answers, results are displayed, showing which answers people chose and which was the correct answer. This can work as a good way of gauging student knowledge and identifying any major knowledge gaps. A leaderboard is then displayed, ranking players and awarding points to those who chose the correct answer. You can also set it to award extra points for the fastest answers. This is a great way to motivate students to engage with your questions, as it allows individuals or teams to compete against each other. Dividing students into teams can encourage collaboration and discussion which can be a good way of getting shyer students to engage with their peers and take an active part in discussion . Featuring energetic music and bright colourful imagery, Kahoot can also be an excellent way to get students energised and excited about a class, especially early in the day. Kahoot has also recently been updated with a new feature called Challenge mode, this allows students to play Kahoot quizzes outside of class against themselves in order to beat their own high score. This can function as a more fun and accessible way for students to revise information and their understanding of topics. Yes, Kahoot is completely free..
Kahoot can be accessed through a web page on any computer device, there is also an app that can be downloaded for mobile and tablet devices on both Android and iOS. Use as an icebreaking tool for new cohorts of students. If you assign them to work together in teams it strongly encourages them to discuss their answers in order to win. Quickly assess understanding on certain topics and identify knowledge gaps. Use open ended questions as a jumping off point to promote discussion if quizzes are created with the discussion mode. Use the survey mode to gather opinions and insights on certain queries. If you are teaching at Sussex University and would like help with using Kahoot or to discuss how this or any other digital tools could help you in your teaching or learning please get in touch with the TEL team. 2 Pings/Trackbacks for "Fun online quizzing with Kahoot!"